Well, M.A.C has done it again. They've created a product so beautiful I can't bring myself to actually use it. 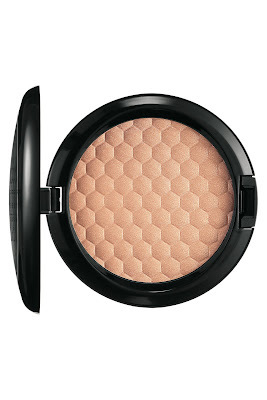 I think you'll agree that M.A.C Naked Honey High-Light Powder in Honey Light is undeniably beautiful. This limited-edition powder was created specially for the Naked Honey collection -- which, you guessed it, has a honey theme! And I'm totally loving the pattern of this powder, which looks like an embossed honeycomb. Don't you think bees would just love to get their stingers on this? If I can ever actually force myself to ruin the beautiful pattern, it will give me a lusciously bright glow. Maybe I'll dust it across my forehead and cheekbones and shoulders before brunch tomorrow to embrace the dog days of summer. Or maybe I'll just continue to leave it on my vanity as a beauty-themed paperweight!